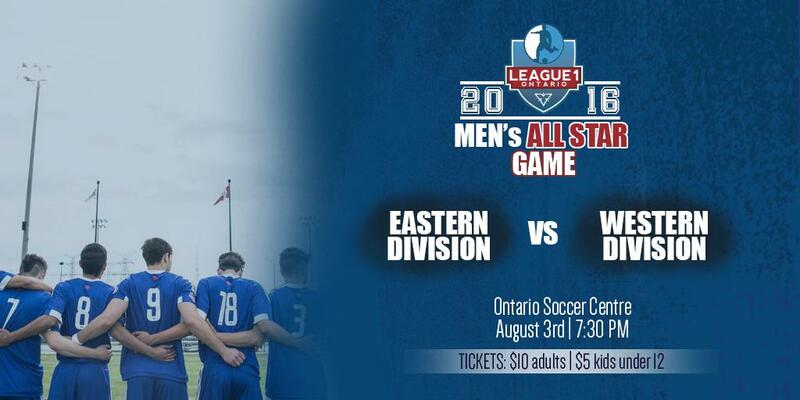 League1 Ontario announced its rosters today for the inaugural Men’s All-Star Game, which pits the best from the Eastern Division versus the best from the Western Division. The 18-player rosters, selected by club coaches and league officials, will have a representative from every team within the League1 Ontario Men’s Division. "League1 Ontario is at the forefront of development for players in our province and for Canada," said Dino Rossi, League1 Ontario Commissioner. "Our first All-Star Game is an opportunity to showcase some of that great talent." The coaches to lead the League1 Ontario Eastern All-Stars will be Peter Pinizzotto (Woodbridge) and Sanford Carabin (Durham United). Mario Despotovic (FC London) and Bobby Smyrniotis (Sigma FC) will patrol the technical area for the League1 Ontairo Western All-Stars. "I think it's great for the league to be able to showcase the best players, so I'm happy the decision has been taken to do it this way this year," Carabin said. "Both myself and Peter (Pinizzotto) know all these players from having played against them, and they will obviously know each other too. We're going to bring them together and get on the same page about the role of this event, and the showcase of the league." Despotovic shared in that excitement about the opportunity this will provide for League1 players and coaches. "As a coach, you need to have a sense of what is going on in the other areas of the province and not just that of FC London for example. I am really looking forward to sharing this experience with the players," Despotovic said. "Bobby (Smyrniotis) and I will look closely at the final list, sit down and discuss each of them… we will choose the best system for that group." Look to League1Ontario.com for full coverage. The All-Star game will be broadcast through the League1 Ontario Livestream channel. When: Aug.3 | Kick-off 7:30 p.m.
Players with asterisks next to their name were the top vote getters at their positions. Some players may not be able to participate in the All Star Game, for a variety of reason. The All Star Team coaching staffs will announce any replacement players on July 28, 2016. League1 Ontario is the only pro-am, standards-based, senior league in Ontario. Founded in 2014, the league began with a 10 team Men’s division, which has now grown to 16 teams and includes a separate 9-team women’s division. League1 Ontario serves as a stepping stone between the youth, amateur ranks and the full-on professional sides.